Purchased this to go with the Copper Grove Eneas cotton quilt set. AMAZING! Great quality. Highly recommend!! The sateen is smooth and lays beautifully. So easy! Add a touch of classic style to your bedroom with the Superior 300 Thread Count Combed Cotton 15-inch Drop Bedskirt. 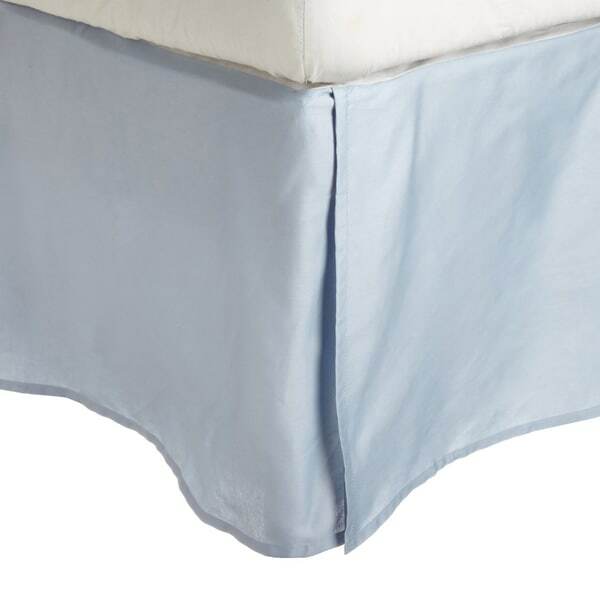 This bedskirt features a 300 thread count sateen cotton construction with a lustrous sheen and overlapping corner openings. Once I ironed the wrinkles out of this bedskirt (from being in the package), it looks amazing on my king bed. The 15-inch drop is perfect and just barely touches the floor. I might get another for one of the spare bedrooms. Bought this in white to hide my queen bed rails. Fits perfectly. not to long or wide. Hides bed rails as if there not ther. Product is made with cotton likr a bed sheet. The ivory color was perfect, not too dark. But the material is super wrinkle-y and thin. I hate that I can almost see through it. Didn't return because my teenage son didn't care, and I just wanted to be done with his room. But if you are looking for a skirt with more substance, keep looking. I'm sure there are better quality bed skirts out there, but this one works fine for my purposes. This would have cost at least twice as much as the department store. The skirt is excellent quality and looks nice on any bed! My son really wanted an orange bedskirt for his bed because it's his favorite color. Orange is really hard to find so I was very pleased to find this. who would have thought i needed a bed skirt? it's really dark. like closer to black than navy blue. And the fabric is REALLY shiny. not what the description really emphasized. At least not what I got from it. Fit well. The color was accurate and it was nice quality. I purchased a king, it arrived and was labeled as a king, but it was actually queen sized and didn’t even cover the box spring from edge to edge. I returned it and had to pay $ in shipping to send back something that was erroneously packaged which was a bit frustrating. Beautiful but out of the package it needs some serious ironing. It is very tailored, the color was just what I wanted. I feel it was a good buy! After ironing, it does look much more like the photo. Updated the review. The Superior 300 Thread Count Combed Cotton 15-inch Drop Bedskirt features elegant center pleat, and an overlapping opening at the corners that helps fit whatever your footboard style. "Is there just pleats at the corners or are there pleats along the sides?" The pleats are at the corners. Mine has two pleats on each long side dividing it into thirds and there is one pleat on the shorter foot end dividing it in half in addition to the corner pleats.